These remind me again of my dear friend Midge rushing into our kitchen one hot Brisbane summer, writing down this recipe on an old envelope & telling me I just had to make it …it was SO simple & SO delicious! It certainly is…& I’ve kept her scrappy memo tucked away with many of those favourite old recipes when I was learning how to cook for a family & friends. It reminds me too of the classic vegetarian Spanish Gazpacho-such a beautiful summer soup which I also made then … but I’ll make this old one of Carrier’s recipes remembering Midge that summer. Chunked tomatoes,chopped cucumber and 1/4 red onion, lemon rind & juice. 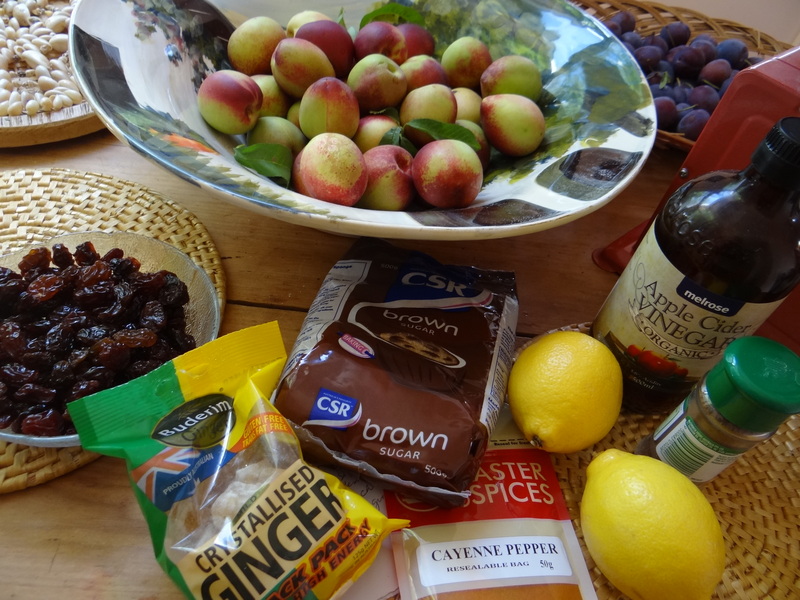 All this can be whizzed together in a flash in a blender. Stir in cream if preferred at end & check seasonings. I’ve taken this recipe from my very old and favourite “A Book of Middle Eastern Food” by Claudia Roden. Beautiful fresh, green & light…to eat with a crunchy green leafy salad…or just as finger food… a fitting antidote to Xmas excess. Leek, green onion, spinach, parsley, tarragon and chives are the ones I used but others may be used instead- 8 eggs, salt & pepper. I also added a few chopped walnuts as suggested. Chop all very finely and add to beaten eggs. Pour into a baking dish and bake in a very moderate oven under foil for 30 mins ,then another 15-20 mins until golden on top. Slice & serve hot or cold. Ingredients: Noodles, any fresh herbs, any vegetable flavourings, left-over meat or other protein, stock ,wine or water. The variations are endless. This is the latest from our fridge and pantry…by no means the most delicious we’ve made, but very nourishing and satisfying. Fennel is the most delicious Autumn and Winter vegetable . Cold weather comfort food! Dry beans soaked overnight then simmered with seasonings (onion,carrot,celery,parsley, pepper & salt pork/ham hock) till tender. Fennel quartered, then lightly caramelised in olive oil, doused with wine, then stock, some ham hock shredded and tender beans added with some parsley or dill…a fragrant and warming winter meal. After a Spinach & Fetta Pide attempt, I thought I’d try a similar dough recipe using a minced meat filling.The usual olive oil onions and garlic are cooked with the meat and spices then fresh tomato, butter & lemon juice are added to enhance the flavour. This dough turned out to be outstanding , though the filling was rather sweet for my taste, so I’ll try out some different fillings next time. Still, the meat pastries will be good to add to the freezer for later. The dough “Ajeenat al-Fatayar” from Syria & Lebanon is designed for meat,spinach, cheese and leek pies and its texture is excellent. 1T sugar, 1/4 cup lukewarm water, 1/4 oz package dry yeast (I used 1 teaspoon), 3 cups flour, 2 T butter, 1/2 tsp salt, 1/8 tsp ground ginger, 3/4 cup warm milk, 1 T olive oil. 1.Dissolve sugar in lukewarm water,sprinkle in yeast & stir, then set in warm place till yeast begins to froth. 2. Mix flour, butter, salt & ginger in large bowl. Add milk and yeast mix and knead well. 3. Shape in a ball and brush all over with olive oil & place back in bowl. Cover with a damp cloth (or cling wrap) & set in warm place to double in size. (The dough can be frozen at this point and defrosted completely before use). 4. Divide into golf sized balls and allow to rest covered again for 2 hours. 5. Roll out into circle 4 or 5 inches across. Place heaped T of mixture in centre , brush some egg white round edge, then fold and pinch into a triangular pastry. Bake at 200 degrees C for 15 to 20 mins. Habeeb Salloum and James Peters. Interlink Books. 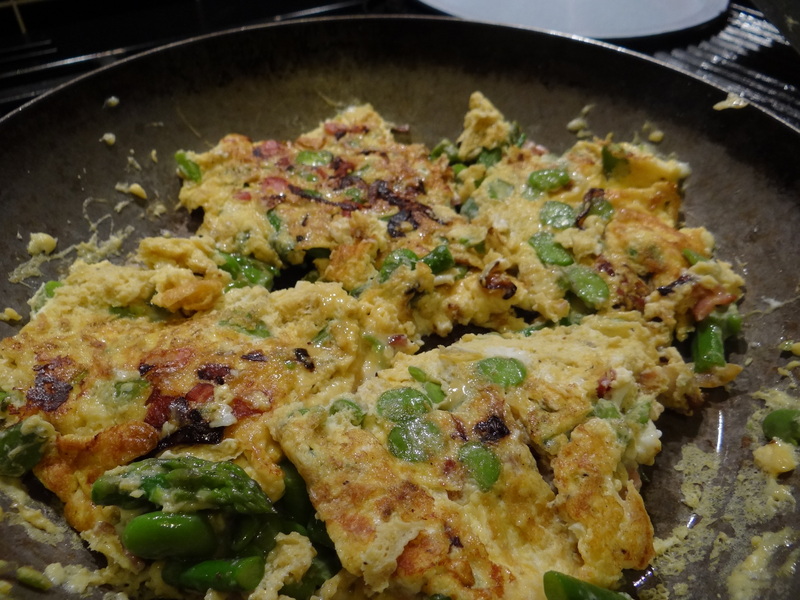 A simple, quick and delicious omlette . 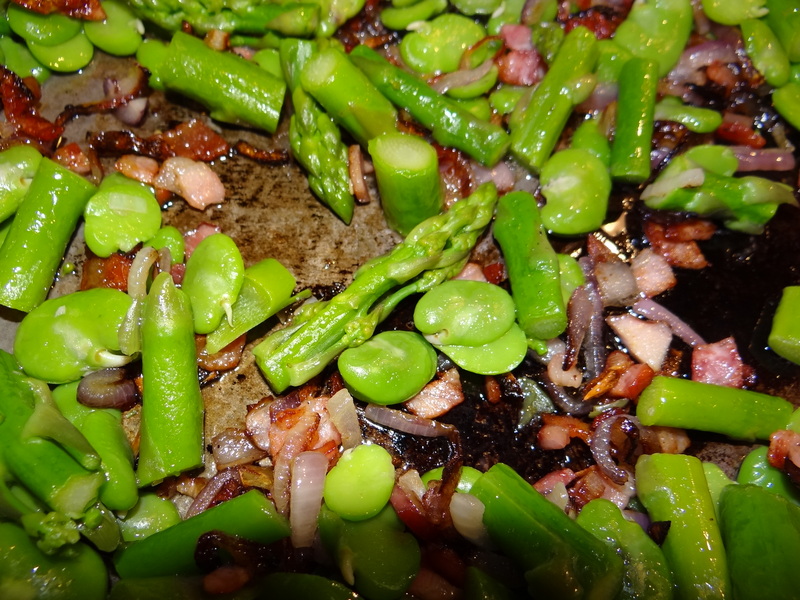 Bacon,red onion, asparagus, broadbeans (skinned). 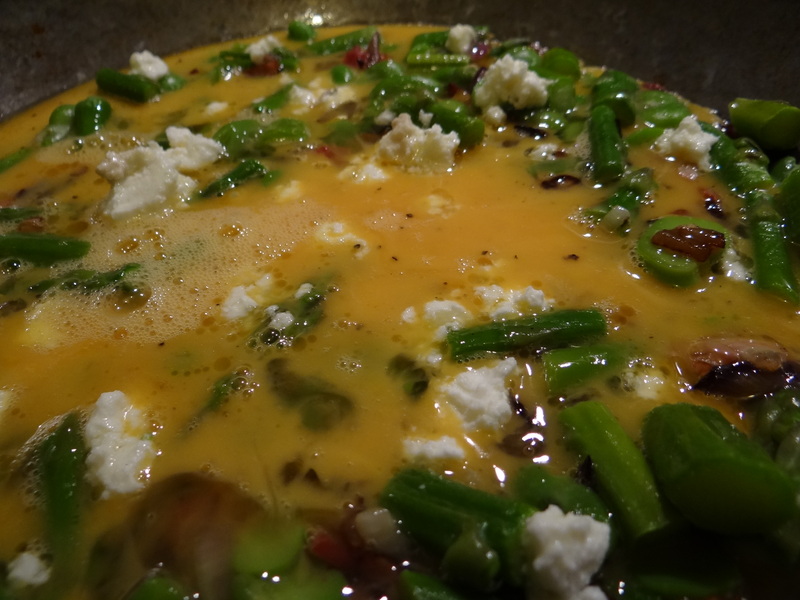 Add 6 eggs,goat’s cheese & seasoning. 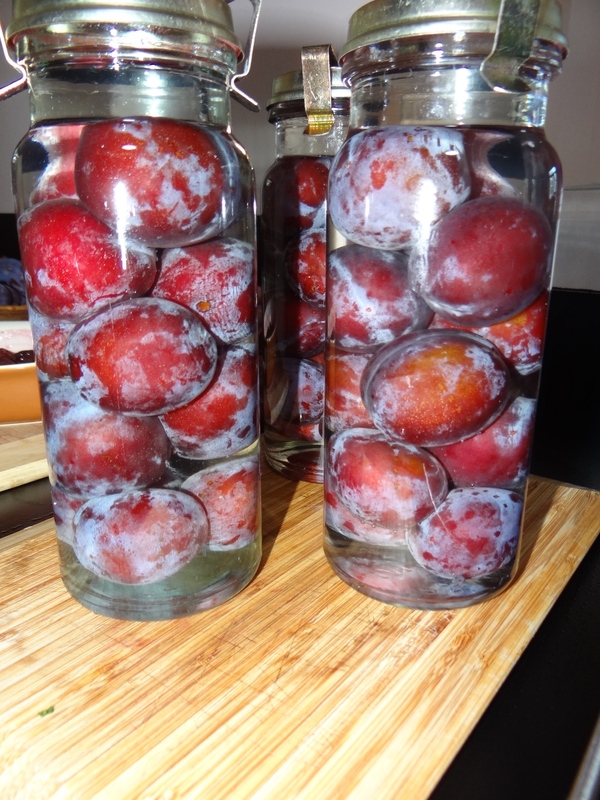 The plums are finished… we’ve definitely had enough and the resident and migratory birds have had their annual treat as well …We’ve given so many away, eaten them every way possible …but thinking of cold winter evenings, finally in desperation, have dragged out an old Vacola stovetop preserver to put a few jars of the beautiful President plums aside in sealed jars. 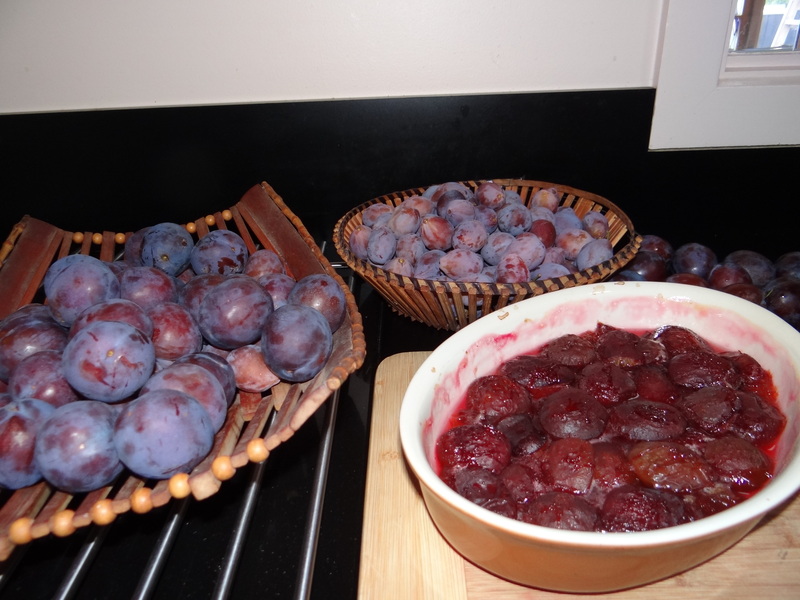 I wish I’d dragged it out sooner for some plundered wild Nectarines which finished up as chutney… no doubt to be enjoyed later anyway. It’s amazing how much late summer harvest there still is on the veggie patch…notably zucchinis,climbing beans and apple cucunbers. We’ve also dug up a great crop of pink-eye potatoes & a neighbour has handed over some feral apples in exchange for some of the plum harvest. avid reader,garden lover and curious cook...recently taken up knitting.